Industrial Portable Blower Fans Feature A Quiet 2-Speed Motor With Thermal Cutoff For Overheat Protection. Industrial Portable Blower Fans provide a roller bearing motor for heat resistant and maintenance-free operation. Sturdy steel housing has formed channels for enhanced rigidity and a powder coat black finish for long lasting durability. Portable fans include a grip handle for easy transport. Grills have curved grid supports and include an 18'L 3-conductor power cord with plug. Direct Drive Fans feature 3 blades that allows blower tilt to direct airflow vertically. Includes two wheels for mobility. Belt Driven Fans have 4 balanced blades and solid rubber wheels for mobility. Meets OSHA standards, UL listed. Available diameters are 24, 30, 36, 42, and 48 inches. Horsepower is 1/3, 2/3, 1, and 1-1/2 hp. Includes 1 Year Limited Warranty.Global model 246607 features a full 360° orbital rotation. 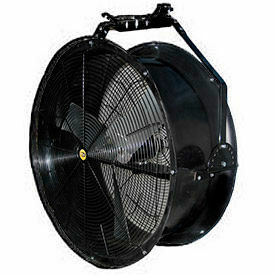 Industrial Portable Blower Fans Provide Air Flow And Cooling For Warehouses, Garages, Recreational Spaces And More. Industrial Portable Blower Fans are made with permanently-lubricated ball bearing motors for reliable performance. Gray steel housing ensures lasting durability. Features spiral wire safety guards for protection from blades. Direct Drive Models feature a PCS type motor that operates 3 aluminum blades. Belt Drive Models feature 4 aluminum blades and a single-phase enclosed motor. Includes 2 rubber wheels on a swivel cart base with 360° drum tilt and 10' SJT 3-conductor power cord. 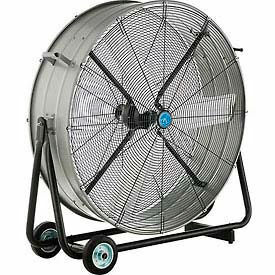 Fans meet OSHA standards and are UL listed (CD Brand is also cUL Listed). 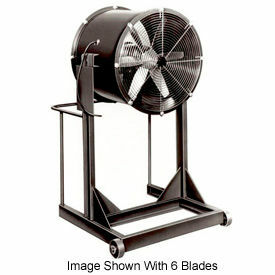 Available fan blade diameters are 30, 36, 42, and 48 inches with 1/4, 1/3, 1/2, 3/4, and 1 hp. Includes 1-Year Limited Warranty. Global Exhaust Fans Help Ventilate And Cool Manholes, Tanks And Crawl Spaces. 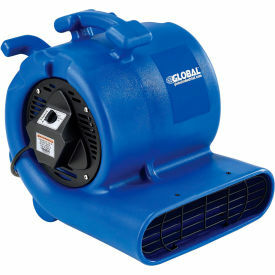 Global blowers are made of steel housing with powder coated steel wire safety guards for long lasting durability. Lightweight and portable with an easy-carry handle. Rubber feet on base minimizes noise and reduces vibrations. Includes 10'L power cord. Ducting provides flexible exhaust vents that easily attach to blower fan. Ducts are made with 2-ply reinforced polyvinyl that is flame retardant and withstands -20° to 180°F temperatures. Blade diameters vary from 8-16 inches and made of aluminum alloy. Global ventilation fan is housed in heavy gauge aluminum. 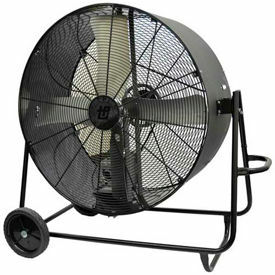 Available styles are Blower Fan, Blower Fan with 16 or 32 foot ducting.. 1 Year Limited Warranty. Blower Exhauster Fans Provide Circulation Of Clean, Breathable Air In Confined Spaces. Blower Exhauster Fans are constructed with conductive ABS or corrosion and chemical resistant polyethylene for long lasting durability. 9-blade impeller offers maximum strength airflow and ventilation in confined workspaces. Wire grill provides safety. Easy-grip handle allows convenient transport. Canister model conveniently reverses from discharge to suction for easy use and storage while protecting duct from rips and tears. Available with or without duct. Types are Blower Fan, Blower w/Ducting, Confined Space Blower Confined Space Blower and Canister, Intrinsically Safe Air Driven Blower. Fan Diameters are 8 in., 12 in. and 16 in.. Color finishes are Black, Orange and Yellow. Available in a variety of HPs and CFMs. Warranties and certifications vary per type. Duct, Duct Coupler, Power Supply, Manhole Entry Device System, Propane Heater for Confined Space Blower are also available. MaxxAir™ Barrel Fans Provide Cooling And Air Flow On Construction Sites, Commercial Garages And More. 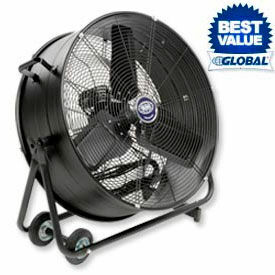 MaxxAir™ Barrel Fans are made with steel and other heavy duty materials to provide lon glasting durability. 2-speed thermally-protected motor and a powder-coated, rust-resistant, OSHA-compliant grille provide optimum performance. 8'L power cord included. Wheels and a built-in handle provide easy mobility. Available with Direct Drive or Belt Drive motor. Diameters are 24", 30", 36" and 42". HPs and CFM highs vary per model. UL and CUL listed. 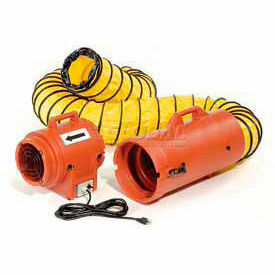 TPI Portable Blowers Fans move the maximum amount of air with the least wind noise. 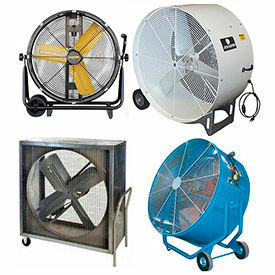 Blower fans are designed for use in storage rooms, warehouses, machine shops, and gymnasiums. Heavy-duty plastic shroud surrounds the 4-paddle aluminum blades. Front and rear roll formed embossments add strength and rigidity. Spiral guard on front and rear protects users. 120V, single-speed, ball-bearing permanently lubricated motor. Also includes: rocker type switch, 15'L, SJT type 3-conductor cord, and 10" hard rubber wheels. Meets OSHA requirements and is UL-listed. Hazardous Location Fans have single-phase explosion proof dual voltage motors (120/240V) with external junction boxes rated for Class 1, Group D and Class 11, Groups E, F and G UL listings, and do not include power cord. Comfort Zone® Blower Fans Are Used For Applications Including Residential, Commercial, Corporate, And More. Comfort Zone® blower fans are made of high quality materials for long lasting durability and dependability. Fans provide efficient air cooling and circulation for offices, workshops, and more. Compact, lightweight design with carry handle allows convenient storage and transport. 3 speed and tilt features allow air flow level and directional control. Fan diameters are 12", 18", 20", and 42". CFM high includes 796, 1059, and 14500. Color finishes are Black and White. ETL approved. Dimensions vary per model. 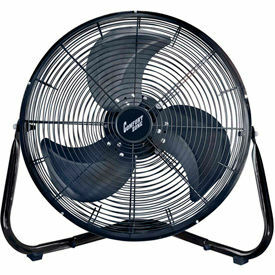 Low Stand Cooling Fans Feature A Wide Base That Stays Close To The Floor For Efficient Cooling Without Tipping Over. 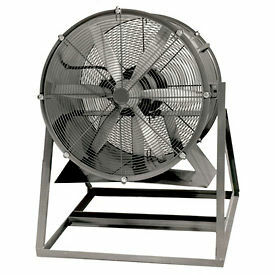 These direct drive fans are made with all welded steel housing. 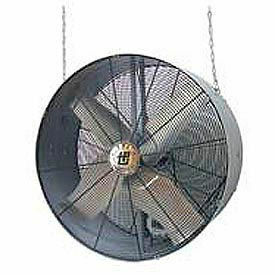 Heavy duty steel fan blades are enclosed in 1/8" thick front and rear circular wire mesh guards. Totally enclosed fan cooled motor. Non-tipping heavy base for stability. Blade construction offered in Steel or Aluminum. Please see model attributes for Construction. Meets OSHA specifications. Sure Flame Low Stand Fans Can Be Placed Anywhere For Efficient Cooling. Sure Flame fans are made with all welded steel housing for long lasting durability. Explosion proof motor used for severe duty. Non-sparking cast aluminum fan blades enclosed in 1/8 inch thick front and rear circular wire mesh guards. Totally enclosed fan cooled motor and non-tipping heavy base provides stability and additional safety measures. Available styles are Ductable, Medium Stand, High Stand and Low Stand. Diameters vary from 12-48 inches. Sure Flame Fans meet OSHA specifications. Heavy Duty Portable Blower Fans Provide Ventilation, Air Cooling, Floor Drying, Water Damage Restoration, and Air Circulation for Warehouses, Garages, Barns, Workshops, and more. 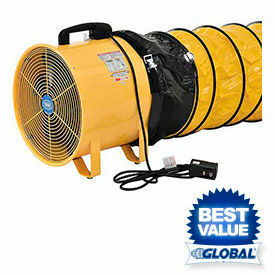 Heavy duty portable blower fans are made of steel for lasting durability. Units allow mobile air regulation and reliable cooling for increased worker and area comfort. Fan diameters range from 10" to 48". Horsepower ranges from 1/10 to 2. CFM Highs up to 17,770. Some models can be stacked for drying applications or heavy duty ventilation needs. Other models feature wall brackets, built-in carrying handles, fan tilt adjustments, enclosed housing, wheels for portability and more. OSHA and UL listed. Dimensions vary per model. Global Industrial 3/4HP Floor Dryer Features 3-Speed Operation Which Provides Up To 2,455 CFM For Superior Floor Drying Capability. Made using injection molded housing and fan assembly for quiet operation. 3/4HP motor with 3-speed operation offers efficient drying for floors, walls and ceilings. Floor dryer allows 3 height adjustment positions for optimum drying. Built-in handle for easy lifting. Air mover includes 20'L power cord. 120V/60Hz; 6.6/6.7/6.8 Amps; 1300/1400/1500 RPM. ETL Approved. 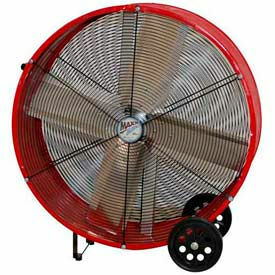 Measures 16"W x 18"D x 17"H.
J&D Poly Chiller Drum Fans are constructed with a One-piece polyethylene venturi housing for easy maintenance and superior performance. Heavy-duty blade and motor mount is attached to multi-adjustment bracket for tilt and lock fan angle adjustments. Safety wire guards enclose ½ HP direct drive motor. Powder coat finished bracket, motor mount and wire guards. Motor features enclosed ball bearing with automatic thermal overload protection. Ready for hard wire installation. 24 Model offers variable speed operation when used with a variable speed control (not included) and 3 aluminum blades. 36 Models have 1-speed with 3 galvanized steel blades. Meets OSHA standards. Motor is UL/ULC recognized. 2 Year Limited Warranty. These blowers suspend for hanging applications using steel chains and S-hooks (Mounting Chains and S-hooks Not Included). Corrosion and dent proof high density polyethylene housing. Permanently lubricated ball bearing motor ensures long life. Front and rear spiral wire safety guards. Includes 15L SJT-type 3-conductor power cord. 3-Phase Motors and Hazardous Location Models do not include power cords. Includes external junction boxes that allow wiring without removing guards. Meets OSHA standards. UL listed. 1 Year Limited Warranty. Belt Drive Models feature 4 aluminum fan blades, 1-speed open drip proof motors and powder coat finished wire guards. Hazardous Location Models have explosion proof motors and are rated for Class I and II protection for flammable and carbon dust environment protection. 115/230V.